Willow Tree is an intimate line of figurative sculptures representing sentiments of love, closeness, healing, courage, hope - all the emotions we encounter in life. Artist Susan Lordi hand carves the original of each figure from her studio in Kansas City Missouri. Pieces are cast from her original carvings, and individually painted by hand. Love My Dog reflects the sixth sense of pets and their unconditional love. Not a toy or children's product. Intended for adults only. 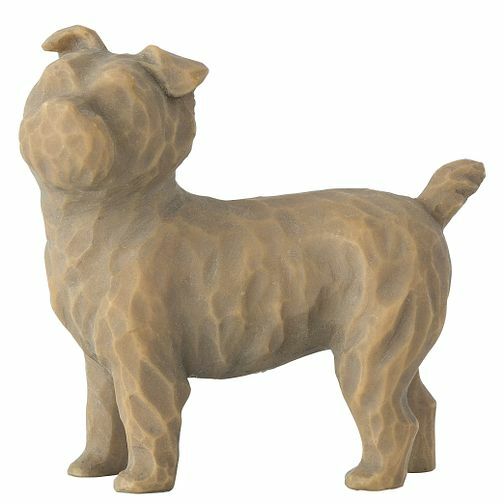 Willow Tree Love My Dog Small Standing Figurine is rated 4.7 out of 5 by 3. Rated 4 out of 5 by Anonymous from Nice little item The delivery of this item was really fast, well informed from sale to delivery. Item smaller than thought it would be but looks ok. Would look great against other willow tree items. Rated 5 out of 5 by Anonymous from Perfect pet for the Willow Tree figures This little dog is so cute. I bought it for a Westie lover , who was over the moon with it , but it could represent several breeds of small dog. It was ideal to join the little boy figure that she has . Willow Tree never disappoint in quality and originality . The pet figures are ideal to complete a family group.